Need two basketballs, 10 players and three minutes on the clock. 1.The middle drives (emphasize jump stops) and pitches to the left wing (emphasize catch ready and communicate location of receiver). 2.The left wing (shot fake) dribble penetrates, executes a jump stop in the paint and pitches to right wing to shooter (emphasize catch ready and communicate location). 3.The shooter rebounds own shot and passes to the middle-drive line area. 4.The players rotate to line they pass to. 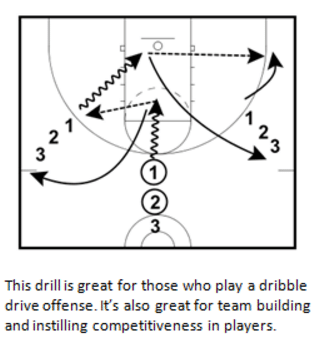 5.Switch the first pass second time through drill to get both wing drives and shots. First 20 made shots (regardless of spot) are worth one point. During last minute, if team has accumulated 20 points any made three-pointer is worth two points. The team goal is 30 points or more in three minutes or coach’s consequence for the difference.